Trick #1: Treat it as a Holiday. What's Scary: Letting your kids consume vast amounts of candy at multiple parties, trick or treating events, school activities, doctor's offices, and everywhere in between. What's a Treat: I love this particular idea, from my friend Ashley Koff, RD, in a recent blog - Teach your kids that Halloween is ONE DAY, not a Treat-A-Palooza that goes on for days, weeks, or even months. Having boundaries makes everyone feel better because they know what to expect in advance. In the days leading up to Halloween, talk with your kids about what they can expect; namely, that it's a fun day, they can eat "lots of candy," but no, they won't be allowed to stash piles of treats under their beds to eaten in the days and weeks ahead. Then you can relax on the big day, and let your kids splurge on their favorites without too much worry. I always try to serve some high protein foods at meals and snacks on Halloween day to even out blood sugar, such as eggs, grilled tofu, hummus, Greek yogurt, or chicken kabobs. You can certainly enjoy multiple festivities, just switch the focus to things that don't involve treats: hold a scary-story writing contest, read a Halloween book by flashlight, create Halloween masks, download the Monster Mash and have a dance party, or organize a costume parade around the neighborhood. Trick #2: Avoid Scary Sugars. What's Scary: Artificial sweeteners and highly refined sugars (such as high fructose corn syrup). While these ingredients aren't the sole cause of obesity (of course), in my opinion they are ingredients to minimize or avoid in your diet. What's a Treat: Look for naturally occurring sugars (i.e., dried fruit, honey sweetened, etc. ), fruit juice concentrate, and organic or fair trade sugars. While all sugars contribute calories to our diet and can lead to tooth decay, these at least are, in my opinion, the best of the bunch as they are more likely to be found in either healthier, or more eco-friendly treats. For instance, I have never found a product that uses organic sugar but also has artificial colors, trans-fats, BHT, or preservatives. Trick #3: Keep Treats a Healthy Color. 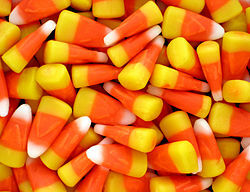 What's Scary: Artificial colors, including Red 3, Red 40, Yellow 5, Yellow 6, Blue 1, and Blue 2. Not only are many food dyes petroleum based, most people would be shocked to learn that these have been banned in Europe starting last summer, or must carry the warning label that they "may have an adverse effect on activity and attention in children." What's a Treat: Naturally occurring pigments in dried fruits, dark chocolate, or veggie chips, or all-natural added colorings from fruit or vegetable extracts (such as annato, beet juice concentrate, pumpkin or carrot extract). These carry none of the potential concerns for behavior or health risks that the scary ones do. Read food labels and avoid anything containing artificial colors. Download "Food Dyes: A Rainbow of Risks" if you want more information, not just for Halloween, but for food choices in general. Trick #4: Don't Spook the Planet. What's Scary: Single-serving conventional candy. Conventional candy often contains fillers, waxes, trans-fats, and other unhealthy ingredients. What's a Treat: Chocolate that's fair trade and/or organic. Because chocolate is grown in areas that are typically rainforest-rich, conservation and proper management is critical to making it a greener choice, and these two claims ensure your chocolate is more eco-friendly by a wider margin than conventional chocolate. To reap the true health benefits of chocolate, choose some that contains at least 70% cocao. This is perhaps the "healthiest" of all the choices given that dark chocolate at least provides some cardiovascular benefits, especially in a modest 1 oz. portion. Make it a point to find fair trade or organic dark chocolate when stocking up. Taza Chocolate, located in Somerville, Massachusetts, has a rich history and relationship with their farmers, as well as a wonderful variety of flavors. Trans Fair USA also provides a great online resource to help you locate fair trade certified™ chocolate, in addition to a number of other fair trade products. If you're buying good quality chocolate, then you can even stretch my holiday rule a bit and enjoy 1 oz portions a few days in a row with a clean conscience. Have any other ideas for keeping your Halloween green and lean? I'd love to hear them!